Abyssinian cats—affectionately referred to as Abys—are short-haired elegant cats with a strong personality. They are considered one of the oldest breeds of domestic cats in the world and may have descended from the cats of Ancient Egypt. Some believe they may have lived at the Courts of the Pharaohs, since mummified cats that have been found at Egyptian excavations sites are strikingly similar in appearance. Notwithstanding their genealogical history—which is inconclusive—they are one of the most popular short haired breeds found in the United States today. Extroverted, willful, and intelligent, one breeder said of them, "…they are very good at training people to do just what they want them to do." 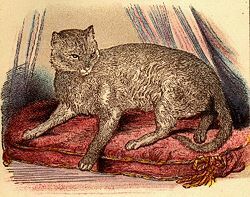 A sketch of Zula, published in Dr. W. Gordon Stables: Cats, Their Points and Characteristics and Curiosities of Cat Life in 1874. The origin of the Abyssinian is shrouded in mystery. Early cat books do not shed much light on the history of this breed because there were few or no records kept. It was thought that the first cat was brought to England by a British soldier, in 1868, after the English army had fought in Abyssinia (present day Ethiopia). It is believed that this cat, named "Zula" is the founder of the Abyssinian line. Another explanation for the origin of the Abyssinian breed has been deduced from genetic studies showing that these cats most probably came from the coast of the Indian Ocean and parts of Southeast Asia. There is a ruddy ticked feline taxidermy exhibit in the Leiden Zoological Museum in Holland which was purchased in the mid 1830s, and labeled as Patrie, domestica India. This indicates the breed may have been introduced into England from India by colonists or merchants who frequently traveled between England and the Indian subcontinent. 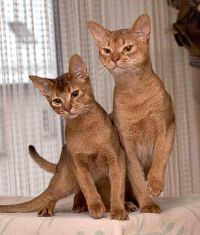 The first Abyssinian registrations occurred in 1896, and the stud book of Great Britain's National Cat Club reveals that Sedgemere Bottle, born in 1892, and Sedgemere Peaty, born in 1894, were registered by Mr. Sam Woodiwiss. Although they appeared regularly in cat shows in the United Kingdom during the late 1800s, the two world wars and a catastrophic outbreak of feline leukemia almost wiped out the breed. It was not until the 1930s that show-quality Abyssinians were exported from England; these cats form the basis of modern day breeding programs in America. 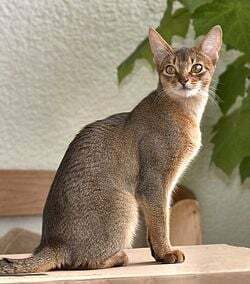 The Abyssinian's singularly defining feature is its ticked, richly colored tabby coat free of markings on its legs, tail, and neck but with dramatic facial markings. Each hair is ticked with four to six bands of color, dark at the tip, lighter at the roots, alternating dark and light. The ideal Abyssinian has a bright color at the hair root that matches the color on its underside and on the inside of its legs. The coat is short, fine, and close-lying. The breed is permitted four coat colors by the Cat Fancier's Association. The original color—and the most common one—is known as ruddy. The coat has a warm, reddish-brown base, with black ticking. In the Usual (another word for Ruddy) Abyssinian, the feet and the backs of the hinds legs are always black. The blue coat has slate blue or gray dark bands of color with alternating bands of warm beige, giving the impression of a warm, dark blue cat with a very subtle look. Blue Abyssinians have become popular in recent years. The fourth color is fawn, which has darker bands of cocoa brown and lighter bands of rose-beige ticking, giving the impression of a warm, antique rose-colored cat. The back of the hind legs and the pads are a darker cream color. Fawn colored Abyssinians are the rarest of the breed. Another allowed coat color is red, with darker bands of color that are chocolate brown, creating the impression of a red, iridescent cat. Another popular color is Sorrel, which has a cinnamon (yellowish-brown) base, with chocolate brown ticking, paw pads, and backs of the legs. Silver Abyssinians are a separate group that have been in existence for decades, but are not recognized by the Cat Fanciers' Association, the world's largest registry of pedigreed cats. In Silvers, the undercoat is always a pure silvery white. The markings include black, blue, warm dark cream and cinnamon. Good Silver Abyssinians are difficult to breed because they sometimes have undesirable tan patches in the coat. In addition to this, any spots in the coat show up more clearly on a silver coat. However, a perfect Silver Abyssianian is a very attractive cat. Rare colors include the Tortoiseshell, Red, Cream, Chocolate, and Lilac, which are all bred on a small scale in Holland and the United Kingdom. Abyssinian kittens are born with dark coats that gradually lighten as they mature. It usually takes several months for the final coat color to be established. Since they carry the gene for long hair it is possible to find Somalis in a litter of Abyssinians. The Abyssinian's body is of medium length with well-developed muscles. Its physique srikes a nice balance between the extremely compact body type and the svelte, lengthy type. Because of their long legs, they appear to be standing on the tips of their toes. The typical Abyssianian likes to arch its back when alert. The legs are slender in proportion to the body, with a fine bone structure. The paws are small and oval. The Abyssinian has a fairly long tail, broad at the base and tapering to a point. The head is broad and moderately wedge-shaped, with almond-shaped eyes that can be gold, green, hazel, or copper. The nose and chin usually form a straight vertical line when viewed in profile. Their alert, relatively large ears are broad and cupped at the base, and moderately pointed at the tips. The head, eyes and ears all fit together in a complementary fashion. Abyssinian cats, or Abys, are often called the "Clowns of the Cat Kingdom"
The Abyssinian is a very active, playful, and inquisitive breed, leading to them being called the "Clowns of the Cat Kingdom." They have also been described as "good problem solvers with an insatiable curiosity." Abyssinians are not usually considered "lap cats," as they are too preoccupied with exploring and playing, but they do need a great deal of contact with the family in order to be happy. They are known to get depressed without daily activity and attention and do not like to be confined. However, when they are ready to be loved they will cuddle up and be petted. They generally get along well with other cats and even with the family dog, but, in most cases, the male will be more easy-going than the female. Like many cats, they enjoy heights and should be provided with vertical access, such as a tall scratching post (or outdoor tree limbs). At times their natural athleticism seems to defy gravity. If they are "shooed" down from a place, such as a table, they will make a game out of returning to it again and again. They make wonderful companions and will even dote on the children in the household, but as is true with all pets, introductions should be made slowly and carefully. They are low-maintenance cats in terms of grooming; a bath during the shedding season and nail clipping started young and given before each bath is sufficient. The first rough draft genome for the domestic cat was sequenced in 2007, by an international team of scientists using an Abyssinian cat. 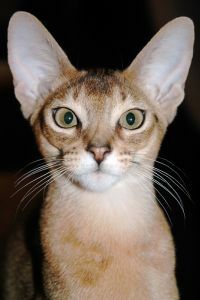 According to study co-author Stephen O'Brien of the National Cancer Institute's Laboratory of Genomic Diversity in Frederick, Maryland, the new sequence is based on the DNA of a four-year-old Abyssinian named Cinnamon, a purebred cat whose lineage can be traced for several generations. Understanding the cat genome may help scientists find the genetic variants that cause human diseases such as leukemia and the degenerative eye disease (retinitis pigmentosa)—of which Cinnamon has both. Studies of infectious diseases such as HIV/AIDS, which has a closely related counterpart in cats, may also get a boost from the sequenced genome. Jake, The Cat From Outer Space (a 1970s Disney movie). Jake's role was played by the brother and sister Abyssinian cats Rumpler and Amber. ↑ 1.0 1.1 1.2 1.3 1.4 1.5 Esther J.J. Verhoef-Verhallen, The Cat Encyclopedia (New York: Firefly Books, 1997, ISBN 1552091538). ↑ About the Abyssinian The Cat Faniciers' Association. Retrieved April 27, 2018. ↑ Rosemonde S. Peltz, History of the Abyssinian Cat. The Abyssinian Homepage. Retrieved April 27, 2018. ↑ Mordecai Siegal (ed. ), The Cat Fanciers' Association Complete Cat Book (New York: Harper Collins, 2004, ISBN 978-0062702333). ↑ Fun Facts of Abyssinians VCA Hospitals. Retrieved May 17, 2018. ↑ Brian Handwerk, Partial Cat Genome Sequenced, May Aid Human Medicine, National Geographic, October 31, 2007. Retrieved April 27, 2018. ↑ Roger Highfield, Cinnamon the cat could offer hope to the blind The Telegraph, October 31, 2007. Retrieved April 27, 2018. ↑ Remembering Punkin Limbaugh RushLimbaugh.com. Retrieved April 27, 2018. ↑ The Cat From Outer Space (1978) Cinema Cats. Retrieved April 27, 2018. This page was last modified on 17 May 2018, at 21:49.